An important Omaha Indian village called Tonwantonga (Large Village) by the Omaha stood on Omaha Creek in this area. Ruled by the great chief Blackbird, an estimated 1,100 people lived in this earthlodge town about 1795 and it played an important role in Indian and exploratory history. Many explorers and fur traders visited this spot before 1800. Near it the Spanish built a fort, armed it with heavy guns, and named it Fort Charles honoring Charles IV. The Lewis and Clark expedition visited the village August 13, 1804, finding it deserted, as the Omaha were away on an extended buffalo hunt. The explorers stayed near the site for a week and held a conference with three chiefs of the Oto tribe who had come to make peace with the absent Omaha. In 1800 disaster had struck the village as smallpox killed an estimated 400 including the famous Chief Blackbird. After Blackbird's death the village ceased to play so important a role in the struggle for control of the Missouri Valley and the Plains beyond. 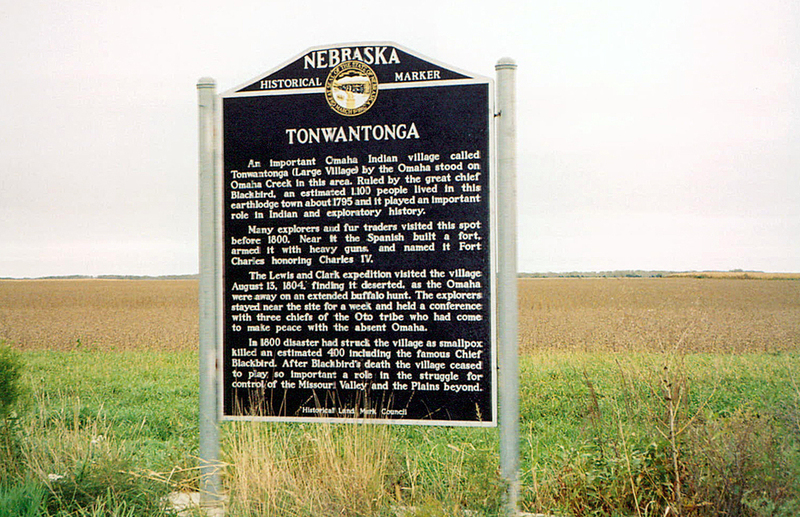 “Tonwantonga,” Explore Nebraska History, accessed April 19, 2019, https://mynehistory.com/items/show/106.